Thanks to ELDR for researching how the stock flasher works which gave me the background needed to figure this out. If you are running LED turn signals you might consider his flasher module which does the same thing but is limited to LED lights only. This mod is really quite simple. It requires cutting two wires close to the flasher connector and wiring in two relays. First, get together the parts and tools you will need to do this. Here is the list of parts and tools that I used. Note on the relays... These are common relays types so you're not stuck with just these brands/part numbers. BUT, you do need to select the smaller relay with some care. 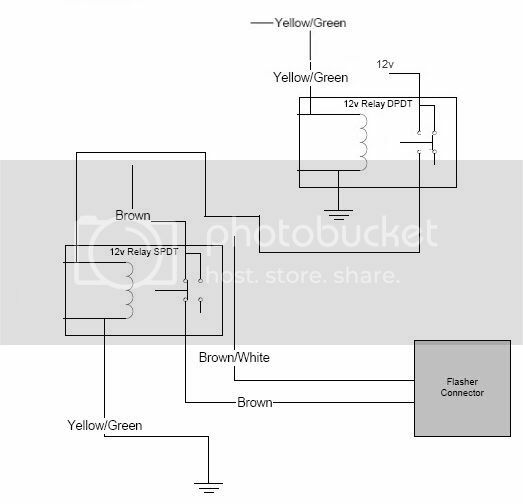 As Cy notes, the auto-cancel doesn't deliver much current/voltage, so you need a relay with a relatively low pull-in voltage and low current draw. The NTE unit has a 70% pull-in rating (8.4 volts) and only draws 150mw (about 13 ma) so if you go with another relay you need to match these specs. And while this relay is a 2PDT, all you really need is a SPST. Now, your going to start by cutting two wires close to the flasher plug, one you can cut as close as you want, the other you need to leave enough wire to strip, tin and solder another wire to. Cut the Yellow/Green wire, you can cut this as close to the connector as you want, as it will NOT get connected back to the connector, this is to drive the 2 amp relay which will in turn drive the 10 amp relay. This is done because the 2 amp relay cannot handle normal bulbs, but the auto cancel unit can't drive the 10 amp relay. Next cut the Brown wire. Make sure to cut this far enough from the connector that you can connect another wire to both ends to extend the wire, you will be inserting the 10 amp relay in here to enable it to turn off the turn signals when the auto cancel unit tells it to. Determine where you want to locate the relays, I located mine just below where the flasher unit lives, and since they are really small and light I let them just hang by the wires, but you can fasten them in place with double sided tape or with zip ties if you wish. For the 2 amp relay find the switch side of the relay and connect the previous relay wire to one side switched setup for normally open operation, connect the other side to either the brown wire of the turn signal relay or as I did connect it to the downstream side of the turn signals fuse (I added it to the crimp connector). Connect the coil, one side to the Green/Yellow wire from the bikes harness, and the other side to a good ground, I used the same ground screw as I used for the other relay. Now, slide some heat shrink over one of the wires for the coil side of the 10 amp relay, but keep it back a ways so it doesn't shrink when you solder the wire. Solder the wire to the output of the 2 amp relay. Push the shrink tubing up and shrink it into place. Connect the other wire to a good ground, I used the ground screw of the accessory connector. Find the leads for the switch side of the 10 amp relay, and find the normally closed side. The DVOM on ohms can be your friend here. Solder a short piece of wire to each side of the normally closed switch. Put shrink tubing over it and shrink it with a heat source (I use the soldering iron). Do the same with the coil side of the relay, keep track of which ones are which. Now, the last electrical part, solder the remaining two wires to the two brown wires, making sure to cover the solder joints with heat shrink. Fasten everything into place, I used the cable tie mounting bases and cable ties to mount things, and your ready to test. If you did everything right, you can turn on the turn signals before starting the bike, and then start the bike. The turn signals should not come on when the key is turned on. If they do, recheck your wiring job and parts, if everything is working properly the system comes up with the flasher inhibited. I was always taught to respect my elders, but it keeps getting harder to find one.